Dress up in the stunning river-green colour of Amazonite for the next gathering to turn heads in appreciation. Collect praises and envious sighs as you strut adorning a little something from our fantastically vast collection of jewellery studded with the rich tones of Amazonite. Amazonite is regarded as “The Stone of Hope” by many. With its earthly tone and spectacular finish, it makes up for just the best kind of jewellery. 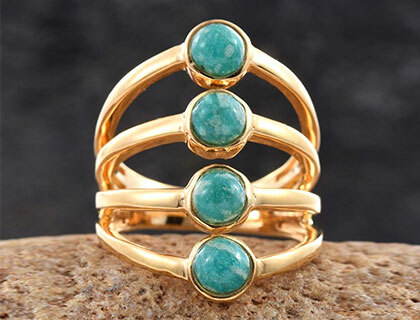 With the luring hues of turquoise green, the stone promises you serenity and calm. It is also called the “Amazon Stone” by some, considering the former procurement location. However, it should be noted that Amazonite is a mineral of limited source, which makes it much more precious. Named after the famed South American River “Amazon,” the stone derives its name from where it was found ages ago. However, now there are lots of places where it can be found. Often confused for nephrite or jadeite, it offers an amazing play of colours. It was believed since ages that it borrows its unique colour from the copper deposits, but recent studies have confirmed that the blue-ish green hues are the result of lead and water in the making of the stone. As of present, you can Amazonite across only a few of locations in the world. For a long period of time in history, it was believed that Russia’s Ilmen Mountains were the only source of the said gem. But now, it is extracted from United States of America, Australia, Madagascar, and Brazil. What’s unique and rare about Amazonite is that it comes in a variety of different colours. Ranging from the light and peppy shades of yellow-green, some stones also portray enriching blue-green hues that successfully entrance all the onlookers. There are also some Amazonites found that present white streaks on the background. The lustre of the stone varies from opaque to translucent. It gives off a brilliant shine when it is polished. Mostly, you can find beads made of this stone as it looks neat and pristine when rounded. It ranks 5.5 to 6 on the Mohs scale of hardness, which means that it is considered to be a soft stone. Any scratches on the shining surface of sheen might also affect the rich look of the stone. When it is polished, the streaks look like intricate webs, but nay crack or external abrasion on the surface might damper the overall look of the stone. It is why you need to be careful when you’re wearing the jewellery studded with Amazonite. Many people regard it as a very powerful stone containing the natural forces of the river that it was said to be derived from – “Amazon.” The vivid blue-green hues are considered to be calming and soothing to the eyes. But its aesthetic appeal isn’t the only reason for its use. There are several healers all across the globe that regard it as a pious stone. They claim that if you as much as hold Amazonite during the time of crisis, it helps you remain stable and of a sound mind frame. Healers also put it on the chest of the patients who have a difficult time dealing with toxic and negative emotions. Many suggest that it is an essential presence if you’re carrying out the ritual to clean your chakras as it helps in establishing a sense of positivity. There have been recorded some other uses of Amazonite over the years. Some people claim that it is the ideal stone for people who struggle communicating from the heart. The same people say that it enhances insight and lets you see things from someone else’s point of view. Knowing that it ranks only 5.5 to 6 on the Mohs scale of hardness, it goes without saying that you need to take immense care of your jewellery as it is prone to scratches and external abrasions. You should also take proper care that it doesn’t press under heavy pressure as it might break. It is also not advisable to expose it to heat or sunlight for a prolonged period as it may fade its colour over time. If you need to clean it, you can use warm water. Fill a bowl with lukewarm water and add a few drops of dish-soap to it. Wash your stone in this water, rinse it under a stream of cool water, and wipe using a soft towel or chamois cloth. Amazonite borrows its name from the location (Amazon River in South America) where it was initially found. Some say that it’s called it because of the river turquoise-green colour it offers. It ranks 5.5 to 6 on the Mohs scale of hardness, which means that it is a relatively soft stone. It is also very much prone to scratches. It is a very important stone for the healing community as it promises to regulate the inner turmoil and fixes the issues of the heart, or so several healers claim. You should keep in mind not to wear Amazonite for long periods in the sun as it tends to fade and/or lose its shape.